"...one of the most beautiful recordings of traditional music..."
"Todd Denman and Dale Russ are a prime example of Irish music becoming borderless these days. Denman, the duo's uilleann piper, and Russ, the fiddler, play in a beautifully restrained style, allowing the innate melodies of these session tunes to come forth naturally. Although they frolic fecklessly together in unison, each also delicately balances the accompaniment while the other solos effortlessly. The result of their carefully articulated music is a rousing spiritual feeling that often separates into a life of its own. Some tunes, like the slow pipe aire of "Eanach Cuain," the tin whistle's tonality on "Todd's Rambles" or the precise, pristine fiddling on "The Stacks of Barley," are wonderful displays of their individual talents. Occasionally there are a few parts shaded in, like piano, bodhrán, and a rippling banjo, but it's only a light hue. Denman and Russ shine brightly throughout." "I first saw a reference to this disc - which is subtitled "an uilleann pipes and fiddle adventure" - when it was listed in Irish Music magazine among the hottest-selling traditional discs in Dublin. It seems that San Francisco's Aniar Records had bypassed the New York-area Irish labels and struck a distribution deal with Gael Linn in Ireland. This means the disc is hard to get on the East Coast, but it's well worth seeking out. 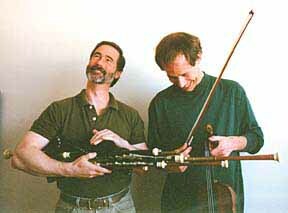 "Clare fiddle sensation Martin Hayes lent his imprimatur to the record in the liner notes, observing that "some of the most authentic Irish music you are likely to hear today is played by American-born musicians living on the west coast of the U.S. Two such musicians are Todd Denman and Dale Russ. "Hayes knows what he's talking about. Reeds and Rosin is one of the best Irish recordings of the year. [And]...one of the best pipes and fiddle duets on record." "The [pipes and fiddle] combination creates an especially warm, rich sound on tracks like "The Holly Bush" and "Come West Along the Road." To this blend, Denman and Russ add depth and complexity through the contrasting textures of pipe reeds and bowed strings. On the solo tracks, the focus on individual expression sharpens the contrast. Dale Russ' lone fiddle sparkles with crisp ornamentation on "The Stack of Barley," "Bantry Bay," and "Rights of Man," and the lonely, untamed sound of solo pipes on "Eanach Duain" sends a shiver down my spine." "These days... some of the most authentic Irish music you are likely to hear is played by American born musicians living on the west coast of the U.S. Two such musicians are Todd Denman and Dale Russ. Their playing demonstrates an intimate knowledge of the music's subtle details and meaning... The music of Dale and Todd is the real thing." "This first collaboration by two old friends listens like an evening in the kitchen: high-level playing on uilleann pipes and fiddle, yet relaxed and unhurried; one might even say, playful. In the best spirit of Irish music they coax and goad each other into gales of "wheeps" and "nyaahhs," playing for the most part note for note throughout. According to Todd, "I learned my first tunes from Dale, and he was literally my first pipe teacher because he was playing the fiddle with pipe-emulated ornamentation, and he was a big fan of Séamus Ennis, which we shared in common." "The unrushed quality is due in part to the lower pitched instruments used on most tracks, the pipes in B-flat and fiddle tuned down (D string to B-flat, etc.). The instruments respond slower, but the resulting sound is rattling, rich and throaty. Todd plays moderately "tight" on the chanter, giving up notes like cracking nuts, but he clearly enjoys the bluesy slide from a lower note, too. Listen to Dale's deft bow overcome the inertia of a softer string. "Several tracks feature the fiddle, unaccompanied. Dale showcases the reels "The Merry Sisters" and the "Boys of Ballysadare." But his hornpipe set, "The Stack of Barley"/"Bantry Bay"/"The Rights of Man," would make the older generation of players proud. Energetic and bouncy tunes played in 2/4 (not 4/4! ), and like the dance, punctuated with rests and loaded with triplets and slides. ...There is much to like here." "This CD presents 54 minutes of masterfully-rendered dance tunes (29) and airs (2)... Reeds and Rosin also features excellent accompaniment by Paul Machlis, Theo Paige, Christy O'Connell, William Coulter and Séamus Egan [from Offaly, Ireland, not Solas Egan]. The playing is swinging and solid throughout, and the recording quality wonderfully clear and full. On at least half the tunes Denman uses a pipe set in B-flat, so anyone wishing to play along will need to retune or have a capo or B-flat whistle handy. Reeds and Rosin is the latest recorded proof that some of the best traditional Irish music around is being made and played in the U.S."
We offer a special Web discount. See our order form for details.